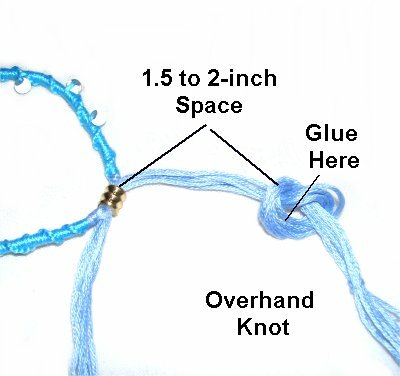 Description: The Spiral Bracelet is a Micro-Macrame design featuring the Half Hitch Spiral, which is very easy to tie. 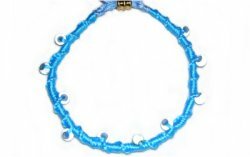 There is a sliding bead clasp, which makes this Macrame bracelet adjustable. The thickness of the bracelet can be changed, simply by using more or less holding cords. 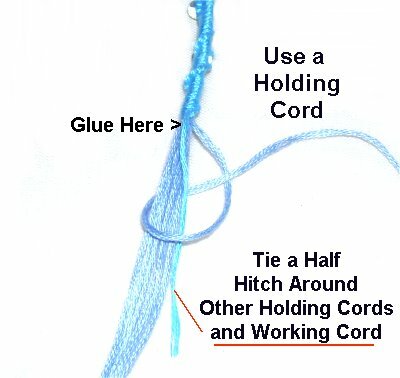 It's important to use cord materials that are soft and comfortable, like the Cotton Embroidery cord shown in the example. When using beads for decoration, try to find the smallest beads you can, with holes suitable for the material you use. The bead used for the clasp needs to have a hole large enough for ALL the holding cords to fit, from both ends. Remember the cords will be compressed, so the hole size can be smaller than you expect. In the example shown, a total of 12 cords were passed through the bead, which had a 4mm hole. Determine your wrist or ankle size, and cut the cords to the lengths in this chart. 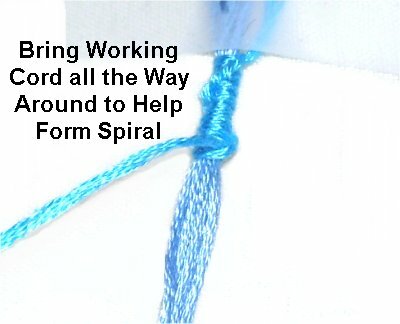 To change the thickness of the Spiral Bracelet, simply add more or reduce the number of holding cords. The cords will overlap, so take that into account. Step 1: Arrange the cords vertically, matching the centers. Place a piece of tape across the cords horizontally, so the bottom is at the center. Make sure the working cord is on the right. Step 2: Tie the first Half Hitch by passing the working cord over - under the holding cords, and over the working cord on the right. Tighten the knot so it rests next to the tape. Bring the cord to the left, then rotate it under the holding cords, moving back to the right. Step 4: Repeat steps 2 - 3, tying more knots for the Spiral Bracelet, until the design measures 1/2 inch. 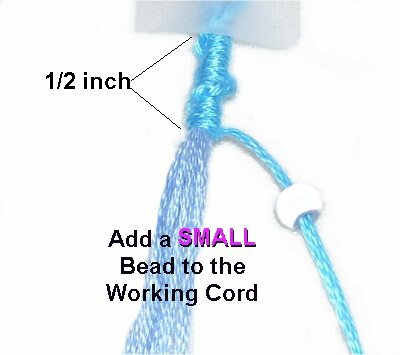 OPTIONAL: Slide a small bead onto the working cord, and then continue, adding more beads every 1/2 inch. Tie a Half Hitch with the holding cord, around ALL the other cords, including the working cord. Apply glue before tightening it, and then pull the end firmly. 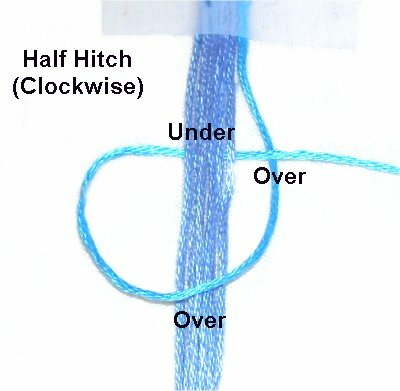 (Optional): Tie an Overhand knot with the working cord and this same holding cord. Step 6: Turn the bracelet design around, and go back to the center. 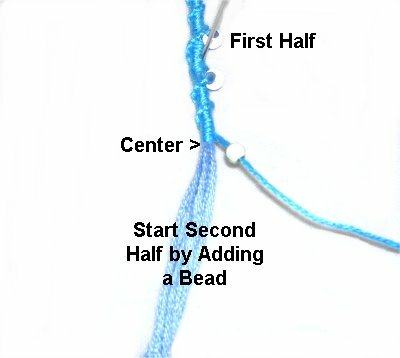 Start the second half by adding a bead, if you decided to use them. Repeat steps 2 - 5. Stop when the Spiral Bracelet is the size you need. Step 7: Trim the holding cords so the ends are even. 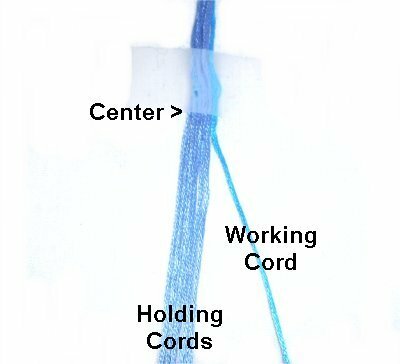 You can cut off what's left of the working cord and the holding cord used in step 5, but the others should be part of the clasp. 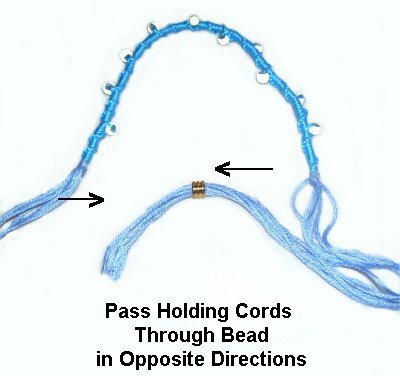 To make the clasp, pass the holding cords through the bead in opposite directions. 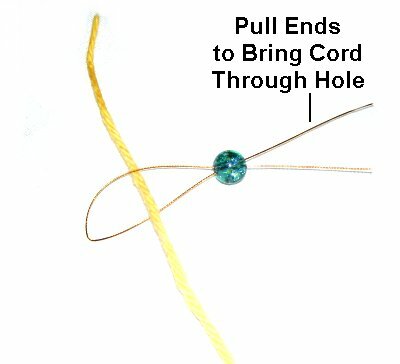 The easiest way to slide multiple cords through a bead is to use a cord threader. Fold a piece of fine wire in half. Pass the ends through the hole in the bead. Place the group of cords through the area near the fold. Pull on the ends of the wire, which will bring it through the bead, along with the cords. Step 8: Pull the ends of the Spiral Bracelet, so the clasp is in the closed position. Leave a 1.5 to 2-inch space, and tie a loose Overhand knot with all the cords in one group working together. Check to make sure your hand fits through when you open the bracelet. Adjust the placement of the knot as needed. When the Overhand knot is in the right place, tighten it firmly. Apply glue before tightening. When the glue is dry, cut off the extra material. Repeat Step 8 with the other group of cords. 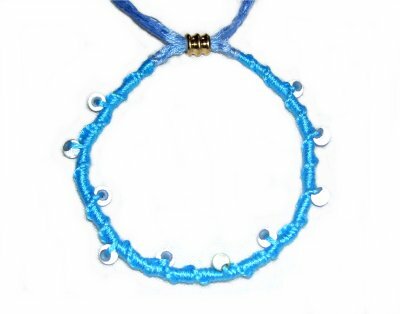 Have any comments about the Spiral Bracelet? Contact Me.